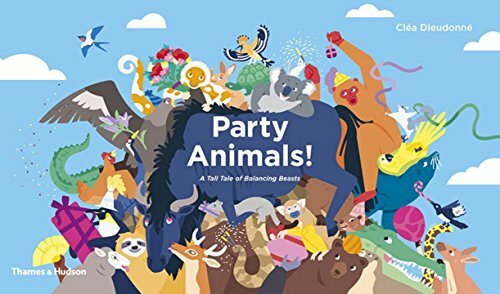 a book review by Catriona Tudor Erler: Party Animals! Publishers are always on the lookout for something fresh and original both for a book’s content as well as its physical form. Often an old idea is given a fresh spin, turning a concept on its ear. Such is the case with Party Animals! : A Tall Tale of Balancing Beasts, a book with roots in the ancient scrolls, that unfolds to a full six feet long. The book’s folded size is a convenient 12” x 7”, but as the reader flips down each successive page, the book extends in length, revealing a tower of animals stretching the full, long length of the single piece of paper. Designed for the five- to eight-year-old reader, Party Animals! combines animal identification with a “Where’s Waldo” hunt for the critters illustrated on the unfolded page. Included are easily recognizable beasts such as donkeys, hens, and parrots along with more arcane creatures such as the wombat, marmoset, meerkat, cuscus, and lion-tailed macaque. The star of the show is the hoopoe bird, which appears on each page as the story literally unfolds. She is the birthday bird. To help children find and identify these beasts and birds, each one featured on the newly opened scene is depicted around the edges of the lower page, accompanied by its name. Some of the animals, such as the tiger and giraffe, are a cinch to find, providing instant gratification for the beginning observer. Others are trickier to locate because they are not depicted realistically, and often they are presented from a different angle from the profile illustrated in the key. This challenge is good for veteran finders. The premise of the story is the hoopoe bird is celebrating her birthday. She has invited all her animal friends to the party. Each new page describes a stage of the party from guests arriving to the balloon decorations, presents, singing happy birthday, and the birthday cake. The pastel-colored, flat-dimensioned animals are presented in a busy, cluttered heap. The calming effect of the pastels feels unharmonious within the context of the lively stack of joyous animals in the story. While the pale color scheme lacks pizzazz, children do enjoy unfolding the pages and crawling over the text to find the hidden animals. The paper stock is reassuringly sturdy, able to hold up to the pressure of little hands and knees. The book’s concept and format is fun and creative, but somehow the package just misses. It needs better writing, a more compelling story (better writing would enliven this story), and a less insipid color palette.